Finally! I have completed my first book in the 30 Day Winter Break Reading Marathon. I’ve wanted to read the Woman in White for so long and now, I’ve done it. The book was written by Wilkie Collins who first had it serialized and then published in full in 1850. The novel is separated into sections with various characters’ narratives featured throughout. At first, I was unsure why these “documents” were being compiled (structure of novel). The answer is slowly revealed and the compilation is collected to help reveal the many secrets within the novel. Seriously, there is a new mystery around every corner but they are all connected. The novel was long, yet incredibly enjoyable and is perfect for this time of year. No better reason than a chilly day to give one an excuse for sitting by the fire and catching up on a 19th Century sensation novel. I was naive to this terminology prior to reading the novel but it seems that there are distinctions made to this sub-genre. 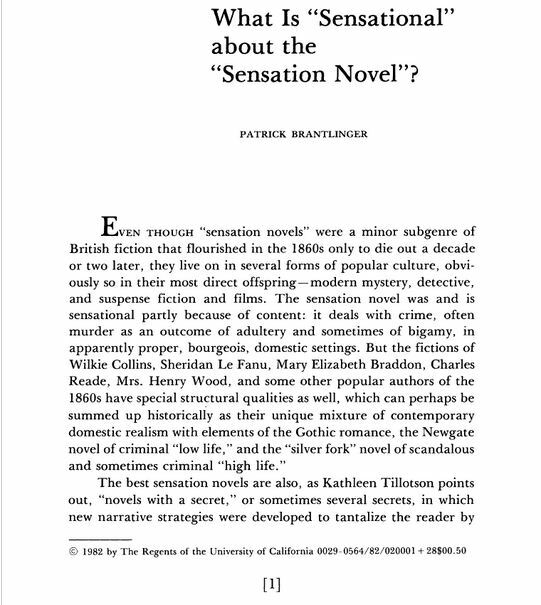 According to an article by Patrick Brantlinger, he describes qualities that define a sensation novel. If you would like to see the whole article, it can be purchased at jstor.org for $12.00 OR if you are affiliated with one of the participating organizations, the article can be accessed for FREE. 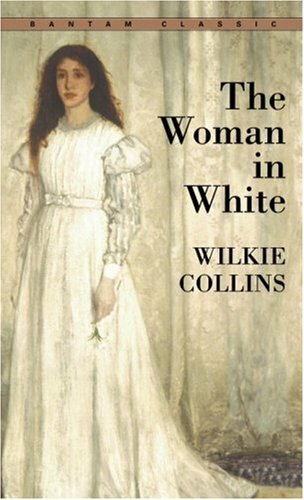 What I found really engaging about The Woman in White is the fact that Collins did not disappoint in answering the many mysteries that he plotted. When he was on the brink of revealing important information, I thought the easy and expected answer would be given (and the characters often thought this as well), but he always went several steps further. Of course, because the book was written in England during the mid-19th C, it did suffer from the notion that women could take ill from merely standing outside in the middle of the night or needed to convalesce because they were probably suffering from the vapors or whatnot. But, I am an able to forgive this aspect and give a favorable review! ← What’s the Opposite of Writer’s Block? You might be happy to know that you can log into JSTOR via the New York Public Library, so you can have the above article for free. No, I don’t work for them, but now that I’m not affiliated with a university, they’ve saved my bacon a thousand times, research-wise, so I pimp them whenever I can. Thanks for the info! I’ll update this post with the participant list. I hope to read the remainder of the article next week. Marian’s my favorite character. I found Laura annoying. Walter was there to help move the story along. A mixture of those three along with their antagonists, secrets, want of money and things done in the past presenting themselves in the present, made for an excellent read. There were certain things that writers couldn’t write about. Although fiction, they were truths that society wanted to remain covered. In a way, that still exists in modern literature. Marian was great; Laura definitely fell into that archetype of young woman (18-21 years old) of novels old that are always taking ill, etc. I know it was a symptom of the time, but I hated it when Marian would belittle her own cunning intellect by putting herself down for being a woman and not a man. She seemed to be the only sane and reliable person wrapped up in all of this.